What's the big deal with restaurant inventory? Let's start with the fact that it saves you truckloads of money. That's right, this process alone reduces food waste, pinpoints theft, and prevents under-ordering. On top of that, it also shows your exact Cost of Goods Sold (COGS), which is a key number in identifying your Prime Cost. And Prime Cost is what you need to know to understand the health of your business. We're talking hard figures - not just a gut feeling. Maybe you knew these facts. Maybe you didn't. Wherever you are in setting up a consistent inventory process at your restaurant, we've got 7 ways you can make this process faster, easier and more profitable. It's hard to do anything - much less a challenging task like inventory - by yourself. Training your staff to understand and value taking inventory will mean it becomes a part of the ebb and flow of running your business. How do you get your team excited about the inventory process? It starts with education. Teach your staff about the benefits to the business, and as a result, to them. For example, if you're able to locate where and when food is going to waste, you can save more money to pay your staff a higher wage. Or you can prevent under-ordering so you never have to 86 a dish, which means customers always get what they want and keep coming back for more. By getting your team to support inventory taking, you'll train your staff to see the importance of this task and make it a must-have process in your business. Once you've educated your team on the importance of inventory, choose one person to receive orders when they come in. Time and money can be lost easily when errors are made in the receiving process. Assigning just one person will make inventory quick and painless. You should train this person on how to mark missing items, how to redirect ordering when there are errors, and even how to code invoices. They can also put away the new inventory that comes through the door and keep the stockrooms organized. By identifying a team member to be your receiver, you can dramatically increase efficiency, create consistency, and even lower your COGS. When you've got someone assigned to receive new inventory, it will be easy to schedule this task weekly on the day of your deliveries. Hold your team and your suppliers accountable for following the agreed-upon schedule. Consistency is important for inventory... without it, you can't get an accurate picture of your food spend from week to week. 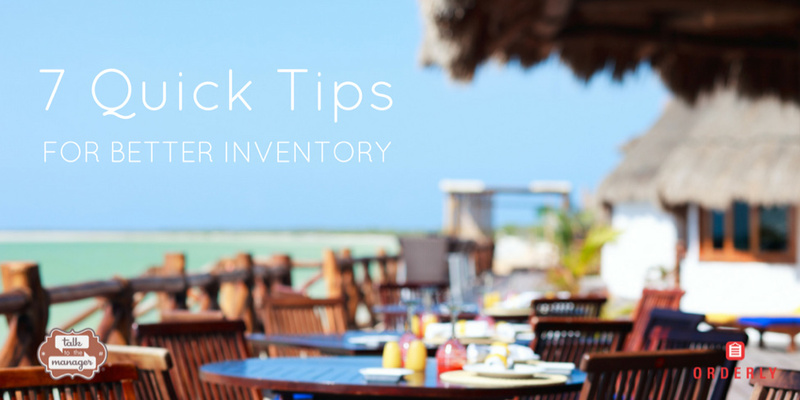 And make sure you complete the inventory process before the doors open for the day or after your restaurant closes. You won't get an accurate count while your team is running in and out of your stockroom and freezer grabbing items. Things happen, so you might get off schedule by a day or two each week. But following a set schedule as closely as possible will give you the most visibility into your numbers. To ensure you're taking an inventory of all items, have your assigned team members conduct a quick organization and cleanup of your stockrooms and freezer before a delivery arrives. Use the first-in, first out methodology: Move older items to the front of shelves so when new items arrive, they can easily be stored back-of-shelf. If two boxes of one item are open, move all the items to one box. Consolidate condiments into as few bottles as possible. Next, throw out rotten or expired ingredients. Make a note if there's a lot left of one item so you can order less of it in the future or work it into your menu this week. Organizing your stockroom is one of those tasks that seems obvious, but a lot of managers ignore. Don't be one of them - it can save you a lot of hassle. One of the best restaurant inventory hacks out there is locating items that are taking up space. When you keep too much inventory on hand, you're actually trapping your money in those unused items. Ideally, you should only be keeping about 1.5 times your COGS in stock to run your business. If it's more than that, it means inventory is taking up precious cash flow. Your best bet is to clean out your stockrooms of this dead inventory. For example, if that bottle of rare liquor is sitting on your shelf, run a special on drinks that use it or raffle it off in a contest. Whatever you do, don't keep these items around for long. They're just eating up money sitting on a shelf. The sad truth is that once an inventory count is taken, most managers just hang the clipboard on the wall until next time... nothing happens with the information that's been gathered. The truth is, if you don't critically analyze your figures and put them to work for you, you're just wasting your time. It's imperative you use the count information you've taken to see where the numbers are off. Are items missing? You can probably bet it's theft. Are there way too many of one item? Those extra crab legs can be sold as a weekly special so they don't go to waste. You also need to calculate your COGS and compare them to your spend for an accurate picture of how well you're staying within your budget. You may need to cut back in certain categories or on certain ingredients where food costs have increased. Where you see severe food spend, you can conduct a supplier review to negotiate better prices. When managers use their inventory taking to look into the numbers, they can save their restaurants from spending too much' and ultimately, from having to fire team members or shut down. Spreadsheets aren't inventory software. You know it, we know it. They require you to input rows upon rows of figures and are prone to human error. There's been a renaissance of restaurant technology over the past 5 years. Apps have changed the way we do everything in our lives - and they have the potential to transform how restaurants run their businesses. From scheduling, to customer service, to reservations, and even to back-of-house tasks like inventory... restaurant apps can help restaurants be more efficient, save time, and save money. Ditching the processes and outdated technology of yesteryear is a must. The proliferation of mobile technology has made using apps for this type of task not only easy, but affordable. Food prices are rising, competition is fierce, and you live every day fearing whether you're going to be able to afford opening your doors and paying your staff. Inventory eliminates all of that. Restaurants who take inventory seriously... who use these 7 tips and invest in technology to make it an imperative part of their businesses - will win. They'll keep tabs on food spend, beat the competition, and understand where every penny of their profits are going. This blog is a guest feature from Joy Ugi at Orderly. Orderly believes in helping restaurants like yours implement better processes for running the business with the LEAST amount of time, effort, and expense. They've started by tackling invoicing, accounting, inventory, and food spend. They've built the Orderly App as an easy-to-use app that will help you move away from the manual, time consuming processes we see in restaurants today. It's a major departure from the clunky hard-to-use technology that has dominated the industry.